Material Type: 14 Karat White Gold. Our jewelry designs include earrings, rings, bracelets, necklace, anklets, etc. Diamond Carat Total Weight: 5.0 Carat Round Diamonds. Gemstones & Carat Total Weight: n/a. B-MAN BRAC CZ 14K 8IN. Add some understated beauty to your look with this traditional jewelry, crafted of polished 14k yellow gold. The timeless bracelet is perfect for any occasion. Jewelry Type: FineGold Karat: 14kStone: No StoneClasp: BoxBracelet Style: LinkColor: YellowMetal Color: YellowMetal: GoldLength: 8 Inch All weights and measurements are approximate and may vary slightly from the listed information. Authentic Italian Braccio Diamonds Curb Link Bracelet. 7.3mm wide. This is aWOW price from Janet's Jewels!Buy it Now before it's too late! Gram Weight: 62. Dazzle with this handsome stainless steel and 14k gold bracelet. The high-polish finish adds shine, and the fold-over clasp keeps it secure whether you are at work or at a party.Brand: Versil Men's fashion bracelet from ChiselStrong stainless steel bracelet with 14k gold accents for an attractive contrastWhite and gold metalHigh polish brings shineFold-over clasp closureMeasures 8.5 inches aroundAll measurements are approximate and may vary slightly from the listed dimensions. All Gold and Silver Jewelry is Karat Stamped as required by law. All diamonds used in our jewelry are conflict free and 100% in compliance with the Kimberley Code and Responsible Jewelry Practices Worldwide. This stunning bracelet is made with flawless top quality VVS flawless lab made diamonds. Each stone is 10mm (3.8 carats). It has the look and shine of genuine diamonds at an affordable price. Each stone is prong set on a heavy stainless steel setting, finished in 14K Gold IP. Feast your eyes on this beautiful treasure which is entirely hand crafted in pure solid 14KT yellow gold. The bracelet is bezel set with 9 brilliant round diamonds weighing approx. 1.15 Carats. The diamonds are on sliders and they move back and forth. 1 Bracelet, 1 Authenticity Certificate. Natural Diamonds. Natural/Synthetic Diamonds. •Custom Jewelery Designing - We Can Manufacture Your Jewelery Design. Our QUALITY can't be beat ! Need Assistance?. Feast your eyes on this beautiful treasure which is entirely hand crafted in pure solid 14KT yellow gold. The bracelet is bezel set with 4 brilliant round diamonds weighing approx. 1.12 Carats. The stones are a blinding white H-I color and piercing SI2 clarity. Diamond Bangle Bracelets. Huggie & Hoop. Diamond Earrings. Diamond Studs. Diamond Pendants. Bracelet Information. Diamond Necklaces. Diamond Ladies' Bracelets. Style: ID/IdentificationLength: 7.5 - 7.99"
[Contact] (https://contact.ebay.com/ws/eBayISAPI.dll?ReturnUserEmail&redirect=0&requested=usdiamondking) | [Book Mark Us] (https://my.ebay.com/ws/eBayISAPI.dll?AcceptSavedSeller&sellerid=usdiamondking&ssPageName=STRK:MEFS:ADDSTR&rt=nc) | [Join Our Newsletter] (https://my.ebay.com/ws/eBayISAPI.dll?AcceptSavedSeller&sellerid=usdiamondking&ssPageName=STRK:MEFS:ADDSTR&rt=nc) Follow us on: --- [Ebay Store] (https://stores.ebay.com/usdiamondking?refid=store) --- [About Us] (https://stores.ebay.com/usdiamondking/pages/aboutme) --- [F.A.Q.] (https://stores.ebay.com/usdiamondking/pages/aboutme#faq) --- [All Listings] (https://stores.ebay.com/usdiamondking/_i.html?rt=nc&_sc=1&_sid=usdiamondking#&_sop=1&_trksid=p4634.c0.m309) --- [Feedback] (https://stores.ebay. Mens 14k White Gold Diamond Bracelet 1.40 Carat SI/E Very Good Condition ! Mens 46.45 grams 14k White Gold Diamond Bracelet 1.40 Carat SI/E Very Good Condition ! It’s moving diamonds on bracelet nice one , all natural diamond good color and clarity , 8 inch of the length ! Diamond Bangle Bracelets. Huggie & Hoop. Featuring a Miami Cuban curb link design, the bracelet is crafted from 14k solid yellow gold and weight is 49 grams. Each link is encrusted with pave set round brilliant cut diamonds totaling 3 carats. It's a heavy duty piece with a weight of 37.5 grams. It's in very good looking condition with a newly polished shine. There are 21 diamonds in total each with a weight of 1/10 carats making the total carat weight 2.10 carats! Feast your eyes on this beautiful treasure which is entirely hand crafted in pure solid 14KT white gold. The bracelet is bezel set with 8 princess cut diamonds weighing approx. 1.12 Carats. The stones are a blinding white H-I color and piercing SI1 clarity. Feast your eyes on this beautiful treasure which is entirely hand crafted in pure solid 14KT white gold. The bracelet is laced with 144 channel set princess cut diamonds weighing approx. 6.00 Carats. 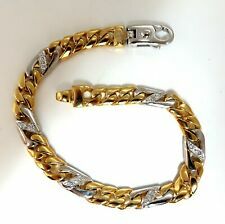 Elegant 14K Karat Solid Yellow Gold Designer Link Mens Bracelet - Nice! Elegant 14K Karat Solid Yellow Gold. Style of Bracelet : Designer Link. Bracelet Length : 8.50" in. Gold Color : Yellow Gold. This item is presented to you by H&R Jewelry & Loan Co. Total Weight : 18.3 Grams. Miami Curb Cuban Link. Diamond Bangle Bracelets. Huggie & Hoop. Handcrafted from 14-karat solid white gold, this Miami cuban curb link bracelet is sparked with 1.20 carat pave set round brilliant cut diamonds on a modern diagonal design. We specialize in fine & designer jewelry, watches & more.